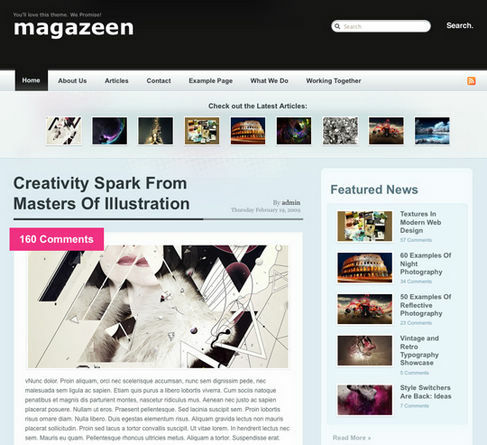 Free Magazine-Look WordPress Theme – Magazeen | WordPress Theme | All Free Web Resources for Designer - Web Design Hot! Smashing Magazine released a free advanced WordPress-theme in a magazine-llok created by the talented WeFunction Design Agency. This bold magazine 2-col-theme was designed with the main focus being on typography, grids and magazine-look. License: The theme is released under GPL. You can use it for all your projects for free and without any restrictions. Please link to this article if you would like to spread the word. You may modify the theme as you wish. This entry was posted on Sunday, December 13th, 2009 at 6:18 pm and is filed under WordPress Theme . You can follow any responses to this entry through the RSS 2.0 feed. You can leave a response, or trackback from your own site.